Yesterday Ana Quirós, a feminist leader was stripped of her Nicaraguan citizenship and expelled from the country. This article appeared in La Prensa on Nov 26th providing some background. Streams of blood fell over the face and shirt of the woman. 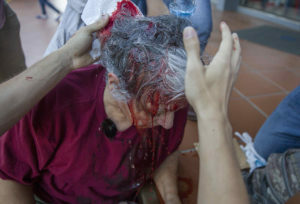 The blow in the head where the blood came from was caused by a iron pipe used by mobs allied with the regime of Daniel Ortega. In addition to her head, they had injured two fingers on one of her hands. The woman was Ana Quirós and she was one of the first victims of the police and paramilitary repression started on April 18 against those who tried to demonstrate against Daniel Ortega. This Monday Quirós was present for an appointment in the General Migration and Foreign National´s Office (DGME), and then was isolated for hours and without knowing what her situation was, the Vice President of Costa Rica, Epsy Campbell, confirmed through Twitter that Quirós was expelled from Nicaragua. She was born in Costa Rica, but has Nicaraguan citizenship. They did not allow Quirós´ lawyer to accompany her to the appointment, nor the Coordinator for the Follow Up Mechanism for Nicaragua (MESENI) from the Interamerican Commission for Human Rights (IACHR), Ana María Tello. Of Mexican parents, Ana Quirós was born in Costa Rica, but since the first time that she visited Nicaragua, when she was 15, she committed herself “profoundly” to the country, she states. Now she has been living in Nicaragua for approximately 40 years. “I chose to live, work, and struggle in Nicaragua. To make my family here,” she said in a press conference Monday morning. She is a feminist defender, expert in Public Health, and leads the non governmental organization “Center for Health Information and Consultancy” (CISAS), which is responsible for promoting “social and cultural rights, with an emphasis on healthy recreation and human rights with adolescents and youth promoters, fathers and mothers,” according to the description on their web site. According to what Quirós stated this Monday, in the summons to the appointment they did not explain the reason for the request, but she stated that she was expecting the worst, as what happened. As she herself denounced, this is not the first time that she faced a situation of this nature. In 2000 the Government of Arnoldo Alemán tried to take her Nicaraguan nationality away from her, but was unsuccessful. The image of Quirós was one of the first that made known the brutal repression that the Ortega regime unleashed against the Nicaraguans who protested against him. That April 18th, Quirós went to the Camino de Oriente along with a group of people to protest against the botched reforms to the Nicaraguan Social Security Institute (INSS). The people were beginning to meet when gangs arrived from the regime to intimidate and later beat with pipes, stones and motorcycle helmets those who were trying to protest. That day dozens of people were left injured, among them journalists who were covering the events. The next day thousands came out to demonstrate, now no longer just over the reforms, but in addition, demanding the departure of the dictator Daniel Ortega and his wife, Rosario Murillo. Since that day, the expert in Public Health attended the marches and has remained firm in her struggle against the dictatorship in the country. “I chose to be a Nicaraguan and I feel I have every right to demand that my rights be protected, that they ensure my rights, and I have every right to demand that there be peace in Nicaragua, there be justice, there be freedom,” stated Quirós, in reference to the fact that she has been an active part in the protests against the dictatorship in Nicaragua, demanding the democratization of the country. “I have the right to repudiate the atrocities and the arbitrary rule that they have been carrying out, the murders, prison or abduction of all these Nicaraguan brothers and sisters,” she pronounced.